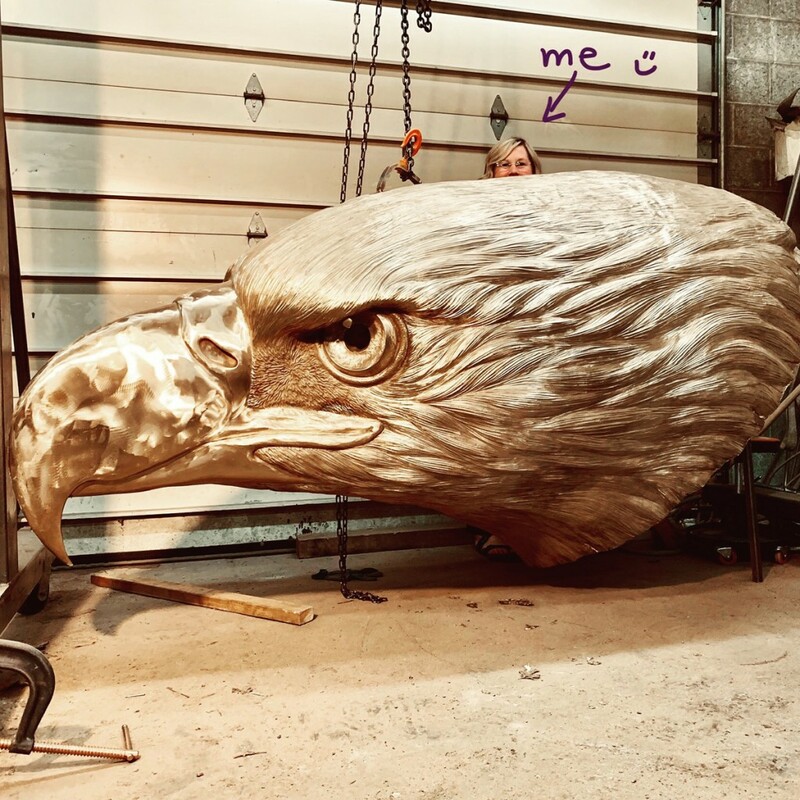 This bald eagle monument will have a 55 foot wingspan when cast in bronze here at our foundry in Cascade Locks, Oregon. He will weigh approximately 8 tons. The clients will take their monument and, along with a marketing team, will be going on tour around the country. There will be a limited edition of 9 monuments cast and the molds will be destroyed. Heather was chosen as the artist for this commission after her clients visited many foundries and artists throughout the region. The clients were adamant that they work with an artist that sculpts her work 100% by hand and doesn’t use scanning technology or the CNC milling robots that are so popular with artists now. 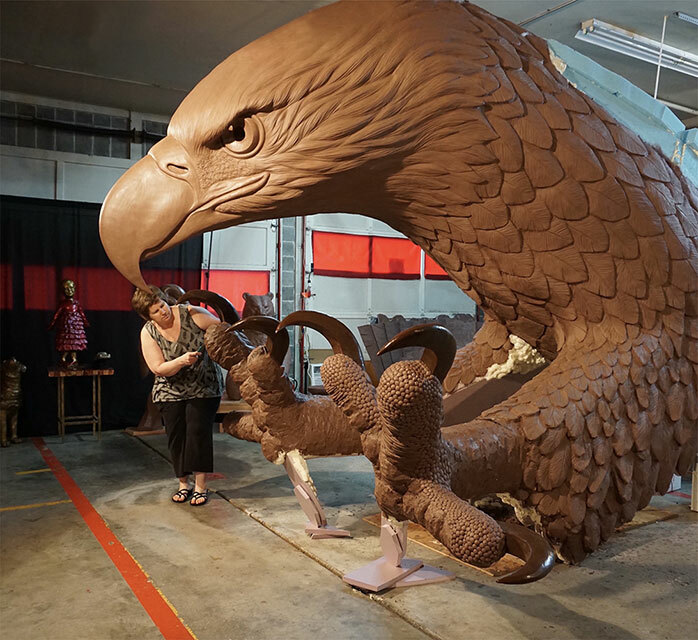 As tempting as that technology would be to make large projects so much easier and faster, Heather finds deep enjoyment in building from the ground up, using her mind and the gifts God gave her to create monumental sculptures. Every stroke of her hands and home-made tools is evident in the clay sculpture. Heather always builds and sculpts the head or face of the sculpture first, then creates the piece around it, guided by the character and personality in the face. She is working on the structure of the legs and preparing to layer oil-based clay onto the foam carving. She then details the clay using her hands and sculpting tools. Heather is sculpting detail in the clay feet, combining realistic anatomy with artistic Interpretation, adding a slightly stylized feel to the sculpture, not just copying detail from photographs. She likes to create work that has organic and flowing elements. The following poem by Alfred Tennyson inspired the feel and movement of her statue. “He clasps the crag with crooked hands; Close to the sun in lonely lands, Ring’d with the azure world, he stands. 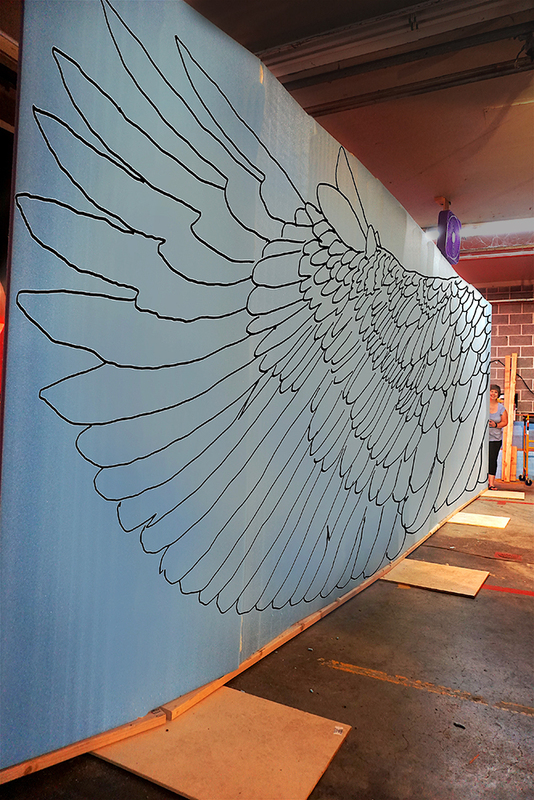 Heather sketched the 25 foot long wing outline she designed, with a giant Sharpie. If you look closely you can see her standing in the far back. 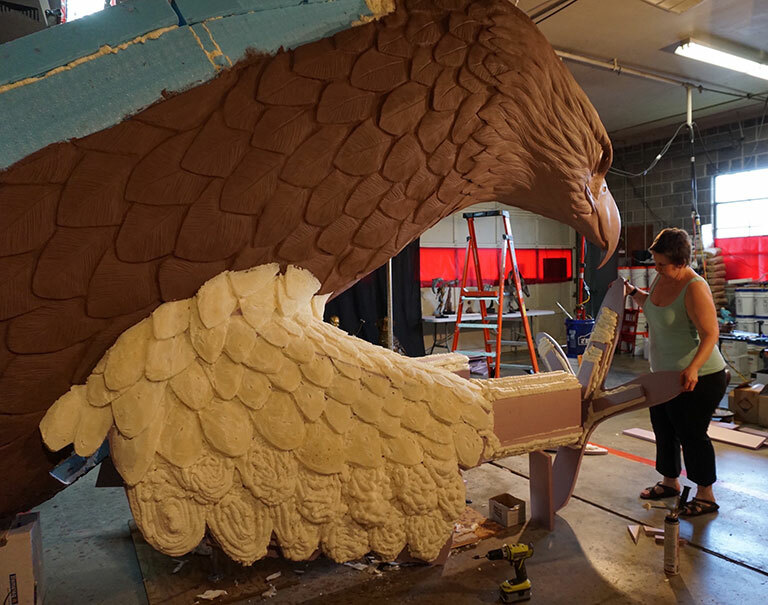 Now she is hand carving the rough anatomy in the foam and will slather clay on to sculpt the feather detail. Heather hand-carved feather, bone anatomy and rough detail in the foam structure of the wing. She then spread melted and warm clay over the foam. 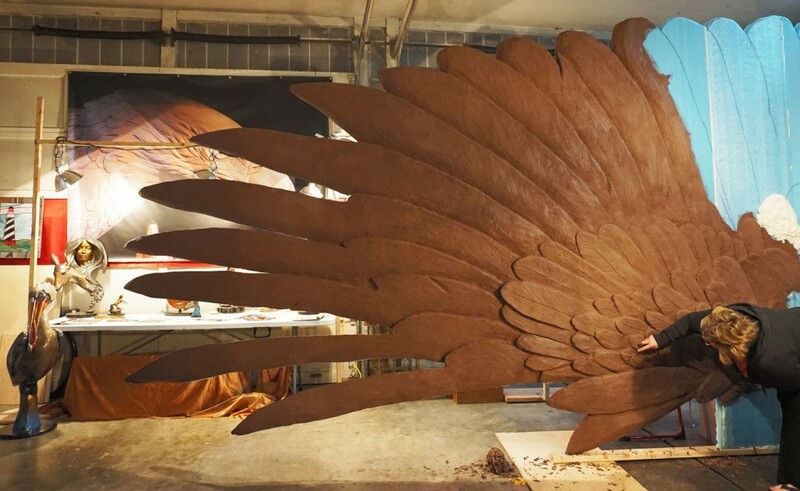 Now she is carving and sculpting the detail of the feathers. 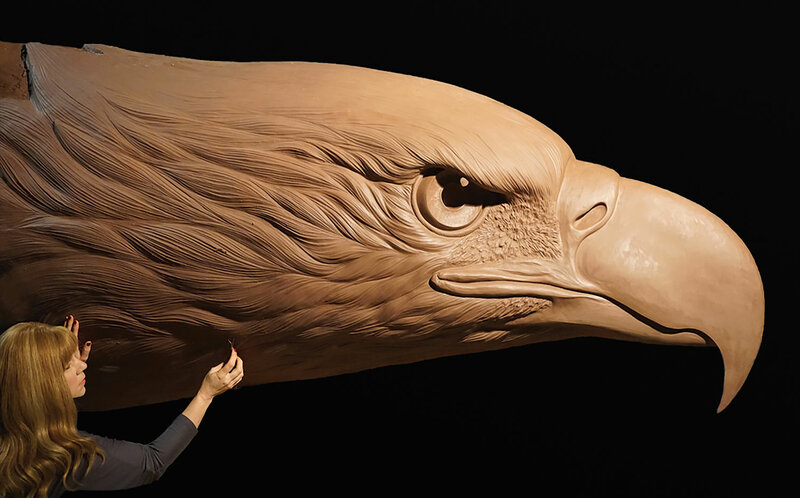 We are working on finishing each separate part of the eagle. Once each section is complete we will assemble the whole statue.